It isn’t easy writing a coming-of-age novel. It is almost treading on dangerous territory. Do you really want to compete with the likes of J.D. Salinger and the rest when it comes to talking about growing up? No matter what the context or the setting, I still believe it is a risky proposition to even consider. At the same time, reading a novel of such a nature can be fulfilling or not for the reader. There will always be the danger of comparison. More so, there will always be that funny moment or instance which you have already read about or experienced. The “newness” then is difficult to look for. I must say that that didn’t happen to me while reading, “The Virgins” by Siddharth Tripathi. I am wary when it comes to reading a debut writer. Like I say these days, “You throw a stone in the country and chances are it will hit a writer”. There are dime a dozen debut writers but to hold your own is the task that I feel not many can get through. Siddharth Tripathi successfully manages that through his book. The imagery of India as is and as is aspirational is brought out very well throughout the book and that was a major selling point for me. I was hooked from the first word. 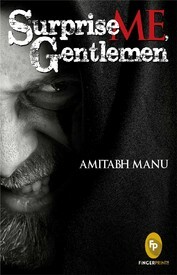 The book is about “becoming a man” and yet at the same time, it is about what it really takes and means to “become a man”. It is layered heavily, but doesn’t seem like at if you are reading it superficially. It is seething with issues and yet Tripathi makes it all a light read, which I am sure it is meant to be, given the audience. 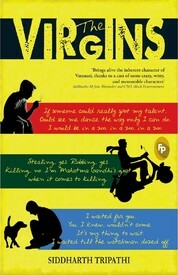 “The Virgins” is about three friends living in Banaras – Pinku, Bhandu and Guggi. Pinku is a school-dropout, with responsibilities towards his family, dreams of marrying a girl he loves and he is all of nineteen. Bhandu’s life is a mess. His family is not the perfect family and he is also searching his way on the road to love. Guggi is always up to no good and trouble, thanks to his friends as well. Besides this, they have their class 12 exams round the corner and life couldn’t get more exciting. From there on in this small town India, their lives begin and take on a different turn. The writing is clean and sparse. It isn’t typical of how teenagers become men. It isn’t typical of all the drama that could have been a part of the book and I can only be thankful that it isn’t. There is nothing crowding the book. I must admit that the book does seem a little long; however that is not what gets in the way of the reading experience. What I felt at times was that the book could have been better edited in some places. The sentences are just in place but may be not all the time. The chapters were too fleeting and that should have been taken care of. Besides this, I loved the plot and the writing. Siddharth knows how to deliver and this is visible through his debut. Banaras almost came to life through this book. The sights, the smells, the traditions, the religious bias, the gossiping neighbors, the uncles and the so-called friendly aunts, all of it was almost like a painting on one big canvas. The book has a lot of soul to it. A lot of scenes will flash through your mind as you read the book. This book makes me want to visit Banaras and experience life there as is and may be even reread the book in the city. A great debut and definitely a must read. This entry was posted in Books, Fiction, FingerPrint!, Review and tagged Banaras, coming of age, Fiction, FingerPrint!, Siddharth Tripathi, The Virgins on May 14, 2013 by thehungryreader. “Surprise Me, Gentlemen” is about a dictator of a nameless state who gets twelve writers in captivity and demands that each of them weave a story in a stipulated amount of time. The condition being: Each story must have a surprise element at the end of it. The stories are then read out by the writers (whose names aren’t mentioned) and then the group decides which is the best and the worst story. The reward for the best story is nothing. The punishment for the worst story: Death. The book had some great potential. A lot could be done with the stories. Whereas some of them were really nice – the one by the Spec-Fic writer on mythology and life (my favourite in the book) to the one narrated by the Urban Writer, on work and depression, there were others that I thought were written in a rush and could have had more time spent on. The element of surprise works well in some stories and in some it just seems predictable. I wish the author would have spent more time on the Dictator’s character which could have been built on and made more sense of. The title as well does not go with the book, considering that some writers are women. However, that is a disconnect I did not delve into and let it go, however had to mention it in this review. According to me, as a writer Manu has what it takes, however as I said earlier, I think he just rushed through the second half. The ending at the same time was a dampener for me and did not take me by surprise, which I am sure it intended to. There are a lot of sub-plots in the book, which could have been charted out in a better manner, leaving the reader happy and satisfied. I would recommend this read only if you want to read some stories from it and not reach the end. This entry was posted in Books, Fiction, FingerPrint!, Review on April 3, 2013 by thehungryreader.